MP3 or WAV 16 or 24bit. 44.1 or 48kHz. 1/8 line in and outs. Built-in stereo mic pairs. Both Uni and Omni directional. 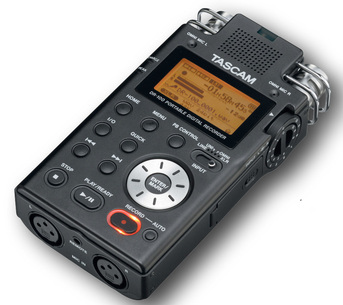 Recording time at max quality: WAV@24bit @48kHz =2hrs on 2gb SD card. Look for a special class on the DR-100 coming soon.